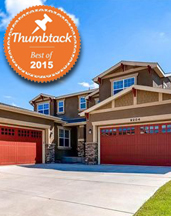 Denver Colorado and the front range have been hit with several class 4 & 5 hailstorms this year. The cleanup process began Tuesday morning for towns around the Denver area, after a violent hail storm hit the area on Monday. 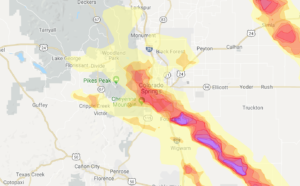 Initially moving from the southwest and dumping heavy snow on Telluride and Crested Butte, the storm system began dropping large chunks of hail as it made its way over Centennial and and Highlands Ranch. 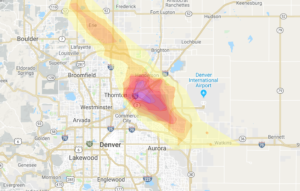 Northglenn, Thornton, and Aurora were all hit hard by hail from the storm. Homes and businesses throughout the area saw extensive damage from the storm. The ice destroyed many roofs and other housing structures, leaving holes for water to seep in through. One restaurant on Arapahoe Road had buckets placed throughout to collect water coming in through its hail-damaged roof. Auto dealerships along Arapahoe Road were left with millions of dollars in damage after cars in their lots took a beating from the storm. One auto dealer said that over 850 new and pre-owned vehicles had extensive damage to them. Most cars take around two years to depreciate 20-30% in value. For cars in the Denver metro area on Monday, it took one afternoon. Outside of dealerships, hail-stricken cars lined the streets with cracked windshield and mirrors, leaving car insurance companies with a lot of work in the following days. For those making car insurance claims, insurance professionals advise photographing damage to keep a record. Cars are only covered for hail damage if the owner purchased a comprehensive insurance policy. If they did, they will still have to pay the deductible. If damage is minor, insurance experts don’t recommend making a claim, as the cost of minor repairs for hail-damaged vehicles is usually less than the amount of the deductible. Although many property owners and businesses were hit hard by the flash hail storm, some are trying to make the best of a bad situation. Groove Ford and Mazda is offering major price discounts on its hail-damaged vehicles. Car buyers can get as much as $18,000 off cars that were affected by the storm. 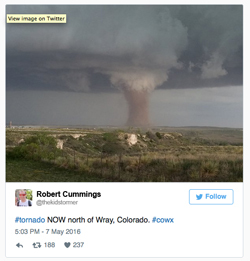 Tornadoes hit Colorado Saturday, damaging property but causing no fatalities. There were 15 reports of tornadoes, according to the Storm Prediction Center. More storms are forecast to batter the Plains on Sunday and Monday. 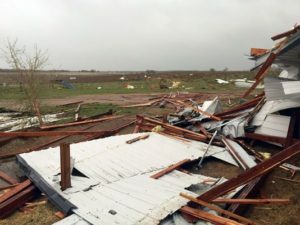 One twister injured five people in Wray, Colo.
Several trailers were also toppled near Wiggins, Colorado, on Saturday afternoon after the National Weather Service confirmed that a tornado had touched down in the area. Two people died and six others were injured in a series of weather-related traffic crashes in northern Arizona Saturday, the Associated Press reported. Around 10 a.m., there was a vehicle roll-over due to tornadoes and hail on Interstate 40 near the community of Ash Fork. Two people tried to help the occupants and were struck and killed by a commercial vehicle. The same system that triggered storms in Colorado on Saturday will move into the central and southern Plains on Sunday. The area is at risk for severe thunderstorms and tornadoes and will be move into Nebraska and into central Texas. Cities where storms are most likely include Topeka, Kan., Oklahoma City, and Kansas City, Mo.The severe weather threat zone Monday will be in Missouri, Arkansas, Louisiana and eastern Texas. Colorado tornadoes are dangerous and can cause severe property damage in a short amount of time. If you feel as though your property has suffered tornado damage recently, please be sure to call RME and contact us immediately for a free, no-obligation inspection.